The Vic-20 is a great little 8-bit computer that never seems to get the love it deserves. In addition to boasting plenty of fantastic original games, it also has a host of impressive arcade conversions. Join us as we take a look at ten of the best games available on Commodore’s machine. With hindsight it may have been more than just a breach of licence that caused Atarisoft to be so keen to have this game removed from the shelves. The other reason strikes you soon after you start playing. 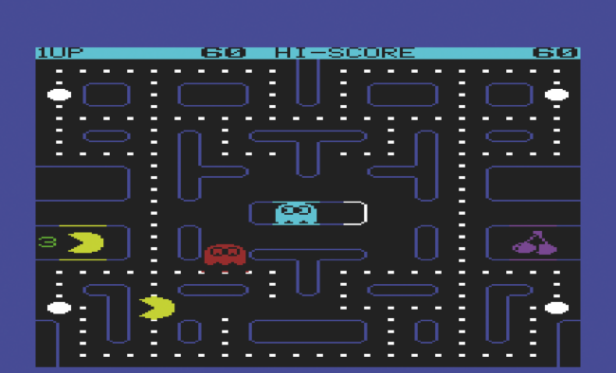 This is actually an incredibly playable and fun version of Pac-Man, far more so than the effort Atarisoft itself later released on the VIC-20. Part of the attraction is the amazingly large software sprites representing the yellow marvel and his foes, as they waltz around the maze after one another. It may not be totally accurate, but then again it was a lot closer than a certain Atari release for the 2600. Including another arcade conversion in the list may seem strange, for VIC-20 usually only went so far to reproduce the machines. There are always exceptions. The expertly programmed Omega Race by Andy Finkel is one such exception. Omega Race was Midway’s only vector arcade game, and he managed to retain the complete look, feel, control and playability of the original. Even under the joystick the ship never feels out of control, and the fast-paced nature of the action makes it a greater draw than Asteroids. We’d go as far to say this edition was better than the later C64 conversion. While the adventures themselves were Scott (or Alexis) Adams’ creations, the five licensed to Commodore were programmed by Andy Finkel, who squeezed the originals into 16K each without any loss of substance. Compression aside Pirate Cove Adventure is accepted as one of the best text adventures available, a two-word command assault upon the high seas to solve problems, acquire treasure and return it to the safety of your living room. Most of the puzzles are fairly logical and this will certainly present a challenge to all who attempt it. Although Gridrunner started Jeff Minter along the path to worldwide notability, its sequel Matrix (aka Attack Of The Mutant Camels in the US) is the better game overall. It’s harder, more varied, can often throw up a few surprises, and fixes some issues from the original (most notably the ability to ‘camp’ in the left-hand column to avoid the vertical zapper). The Score Panic mode of the camel waves raises the tempo, and the snitch character at the top keeps you from staying still too long. And we haven’t mentioned the shot deflectors yet… one of the VIC’s greatest blasters. Epyx had already begun the Temple Of Apshai trilogy when Sword Of Fargoal was released. This was an arcade-like, pared-down version of the dungeon crawler. Your task was to descend through many randomly generated levels in search of the legendary sword, returning to the surface intact. With the ability only to see where you’ve already explored, it made the game a tense, calculating affair as you decide when to fight, when to run and when to grab all that treasure lying about. Each level was confined to the visible screen, making it feel more claustrophobic in nature. More playable than its C64 cousin. “You not good enough for Demon Attack!” screamed the alien in the commercial. As it transpires, however, the VIC-20 versions of Imagic’s Atari 2600 games were good enough, especially this Phoenix clone (allegedly). Take control of the lone fighter battling through 84 waves of demon birds that have various different behaviour patterns and quite often split in half when shot. Given the liberal fire that is raining down upon you, this is no easy task after a few waves have been cleared. Demon Attack maintains the look and feel of the original game, and, needless to say, it retains the difficulty level as well. There’s only one real downside to this game: there’s only one known copy. Thankfully it’s been archived and made available for those who wish to try it out in emulation. It’s just a pity it wasn’t more widely available at the time as it’s a very good game. Much in the style of Tutankham you control an intrepid explorer through lots of different mazes collecting treasure, and despatching the continually multiplying enemies though you can only shoot left or right. Gaining 12 treasures in each maze opens the door to the next. Fast paced, challenging and addictive, Key Quest well worth checking out. Rest assured that Llamasoft barely ever released a dud for the VIC-20, which is why another of Jeff’s games features in the list. Controlling two guns at once, you must defend the outpost against the invading Zzyax aliens. While the C64 version allowed for simultaneous two-player action, the VIC-20 original is again arguably the better and more playable title. It is certainly harder by way of the smaller graphics, requiring more precise aiming especially if one of the nasties manages to land on a gun axis. At higher levels it needs total concentration, almost putting yourself “in the zone”, a state quite often achieved with Llamasoft titles. Software Project’s Perils Of Willy somehow managed to squeeze in 33 screens of action using the 16K memory expansion. Astro Nell, on the other hand, provides the VIC-20 with a Jet Set Willy multi-screen experience stuffed into… well, no expanded memory whatsoever. If you can see beyond the astonishment and wonderment of how this is all possible, you also discover that it is just as tricky, nasty and polished as the game it imitates. This is old-school gaming requiring accurate jumps, paper on which to map out the rooms, and a plan to collect all of the items. So much for concessions based on age. WarioWare is a fairly new concept but it has already spawned a few imitators. But would you ever believe that one would appear on the VIC-20? While made simpler to control by requiring only the press (or presses) of the button as opposed to also moving the joystick, it doesn’t mean that there is a loss of difficulty. Far from it, many of them are no pushover. Jeff Daniels has also managed to cram a surprising number of different mini-games into just 3.5K, making it a varied and non-repetitive experience. If he carries through his plan for a sequel using the 8K expansion, it should be something worth looking forward to.